Chinese fortunes fill the interior of this ornament. Cheri: My kids and I have a tradition. We have a standing date on Saturday where we go to our local Chinese food restaurant, China Lane. We have been doing this for about a year now and we still are not tired of it. It is nice for me because I really get to connect with my kids while doing something we all enjoy. I always save our fortunes that are in our fortune cookies. So far I have used some of the fortunes on my fortune cookie tree, featured here a few months ago. 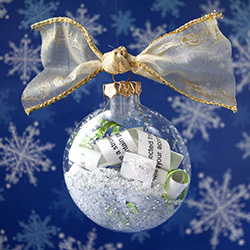 I am always on the look out for other uses for the items I collect and I thought they would be great to put in an ornament. This was a very easy ornament to make for the Christmas Ornament Countdown. 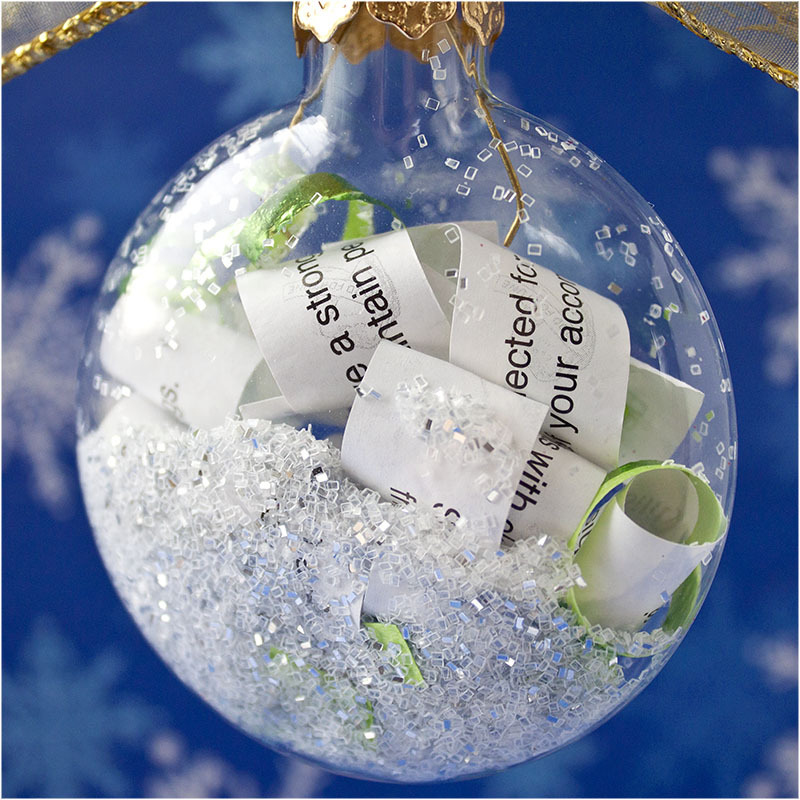 All I did was get a clear glass ornament, took the cap off, rolled the fortune with the wording on the outside and put it into the ornament. I added some glitter and some snips of ribbon, put the cap back on and tied a pretty piece of ribbon to the top of the cap. This ornament has a lot of meaning for me when I look at it. It reminds me of all the fun my kids and I have had and I will be able to think of those memories each time I look at this ornament. This would be neat if you were to have your kids write special little messages or if you wanted to give someone a special message. I love to make ornaments that have special meaning to me. Give it a try, I’m sure the ornament you make will become one of your favorites. Hope you have a Merry Christmas. I put glitter and snips of colorful ribbon in with the fortunes. My husband and I have a similar tradition. 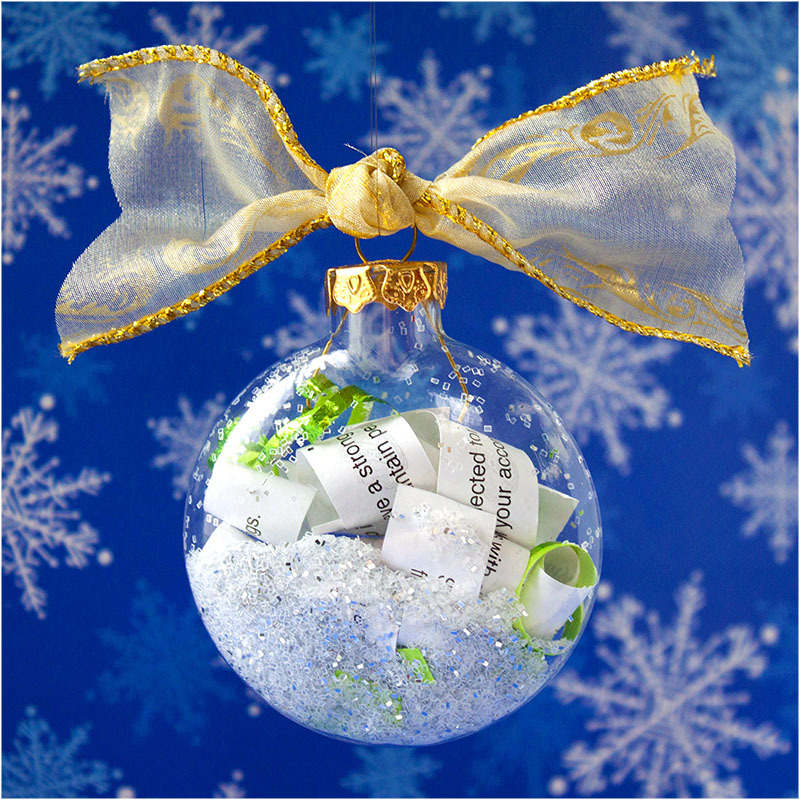 Through the year we jot notes about memorable things in our lives and stuff them inside an ornament that opens. On Christmas day we open the ornament and share our memories. Each year I make a new ornament to hang. That is such a lovely idea. Thank you so much for sharing it. Thanks Loryn. It really helps us to focus on the positive and keeps us close. I highly reccomend it for a new couple!